Just 668 infiltrators living illegally in Israel took advantage of deal to leave country voluntarily in exchange for $3,500 in cash. The number of illegal immigrants from Eritrea, Sudan, and Somalia living in Israel who voluntarily left the country fell sharply during the first three months of 2018, according to a report by the Interior Ministry’s Population and Immigration Authority. 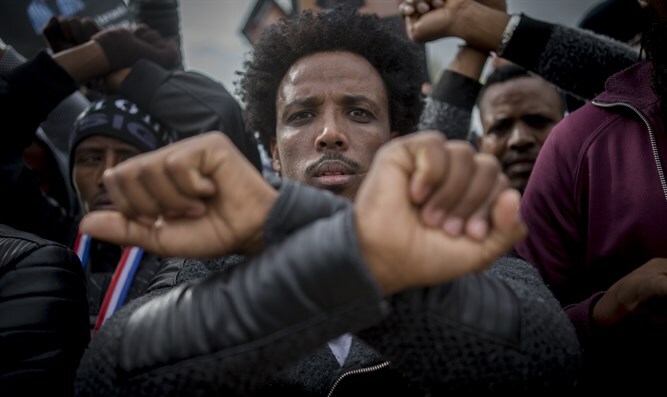 Just 668 citizens of African countries – nearly all of them Eritreans, Sudans, and Somalians – who had illegally crossed into Israel self-deported during the first three months of 2018, including just 172 who voluntarily left the country in March, ahead of a planned deportation program, later frozen by the Supreme Court. Tens of thousands of Eritreans, Somalians, and Sudanese infiltrated across the Israel-Egypt border beginning in the mid-2000s, prior to the construction of the security fence in 2012 and 2013. Since the fence’s completion, illegal crossings have fallen to almost zero. More than 36,000 infiltrators remain in Israel as of April 1st, however, more than 92% of whom are Eritrean and Sudanese nationals. This figure does not, however, include the thousands of children born to the illegal immigrants after the entered Israel. While more than 12,000 infiltrators were to be deported to third countries – widely believed to be Uganda and Rwanda, the Supreme Court froze the plan earlier this year, after having nullified a similar plan in 2017. The deportation plan, which won the backing of Prime Minister Binyamin Netanyahu’s coalition government, drew strong criticism from left-wing NGOs at home, and Democratic lawmakers in the US. Eighteen Jewish House Democrats penned a letter to Netanyahu expressing their ‘dismay’ and disappointment with his rejection earlier this month of a deal with the United Nations to legalize half of the infiltrators in Israel, in exchange for promises by the United Nations High Commissioner for Refugees to find other countries willing to accept the remaining illegal immigrants. On Tuesday, the Israeli government acknowledged that following the Supreme Court ruling and subsequent denials by Rwanda and Uganda that they had agreed to accept deportees, there were no plans at this time to remove the infiltrators from Israeli territory. "At this stage there is no possibility of involuntary deportation to a third country," the statement read. It further noted that since last Wednesday "the hearings have been suspended in accordance with the deportation procedure, and accordingly, no further decisions regarding removal to a third country will be made at this time." In previous years, thousands of infiltrators have self-deported, accepting an offer by the Israeli government of $3,500 and plane tickets to their home country or a third-country. More than 3,300 left Israel in 2017 – representing a rate of departure roughly one-quarter faster than in 2018.